Donate with Ease: Pledge Direct & Amazon Smile! 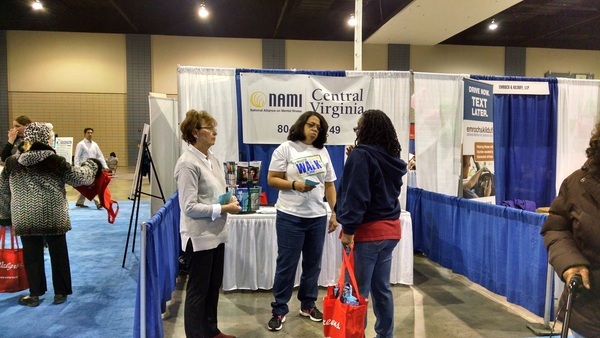 Hello to our NAMI Central Virginia family! My first order of business is to wish everyone a very Happy Holiday Season. -- the gifts you haven’t wrapped, the pile of cookie exchange invites, the office parties. • Keep expectations for the holiday season manageable. Try to set realistic goals for yourself. Pace yourself and organize your time. Make a list and prioritize the activities most important to you. • Be realistic about what you can and cannot do. Don't put the entire focus on just one day (i.e. Thanksgiving Day, Hanukah, Christmas Day, etc ). Remember that it's a season of holiday sentiment, NOT JUST ONE DAY, and activities can be spread out to lessen stress and increase enjoyment. • Leave "yesteryear" in the past and focus toward the future. Life brings changes and each season is different and can be enjoyed in its own way. Don't set yourself up in comparing today with the "good ol' days." • Do something nice for someone else less fortunate than you. Try volunteering some of your time to help others. • Enjoy activities that are free, such as taking a drive to look at holiday decorations, going window shopping or making a snow-person with someone you care about. • Be aware of excessive drinking. It will only increase your feelings of stress. • Try something new; like celebrating the holidays in a new way. • Spend time with supportive and caring people. Reach out and make new friends, or connect with someone you haven't heard from in while. Most of all, save time for yourself and recharge your batteries! Let others share in the responsibility of planning activities and don’t try to do it alone. reach out to someone who cares; Your NAMI CVA Family! The Annual Holiday Party will be at the Weinstein JCC on Tuesday, December 15th at 6:00, with food served at 6:30. Click here for directions to the event. Please RSVP to the office if you are attending, and include how many additional people are in your party. Members are encouraged to bring a generous covered dish and a serving spoon. NAMI Central Virginia will provide chicken, beverages, ice, paper products, and plastic ware. The Holiday Party will feature bingo, prizes, and fellowship! It has been a holiday tradition to collect various gifts at the Annual Holiday Party and distribute them to select group homes in the region. This year's major recipient will be the Marshall Center, operated by Richmond Behavioral Health Authority. 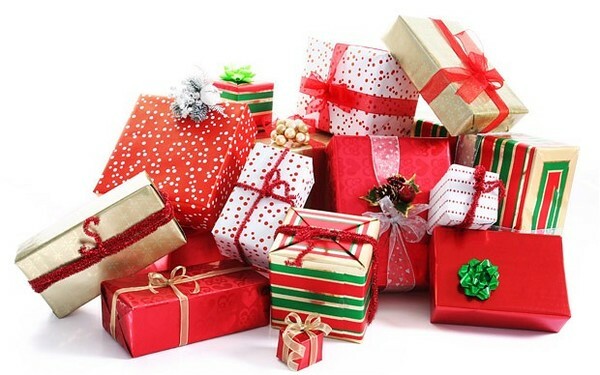 "Wallets, playing cards, scarves, XL gloves, large knit hats, large socks, toiletries in plastic, checkers/board games, $5 gift cards, change purses, jewelry, holiday door decorations, sunglasses, sugar free candy, nonperishable food, cosmetics, after shave in plastic bottle, lotion in plastic tube or bottle, batteries, stationery, pens, art supplies, plastic mugs, $5 watches, notebook, note pads, slipper socks, crossword puzzle books, canvas bags, powdered drink mix, disposable camera, shampoo, cream rinse, hand sanitizer, antibiotic hand wash, wash clothes, scrapbook, plastic picture frames, calendars, scotch tape, emery boards, lip balm, tissue packets for purse or pocket, antibacterial wipes for purse, CD's, DVD's, ear buds, paperback books, pencil sharpener, leggings, hair barrettes, ponytail holders, hair bands. Please, no glass, candles, or belts"
Please note that to attend this event, you should have already attended Workshop 1: "Telling Your Story". You should also be sure bring your story with you to this workshop. NAMI-CVA would like to highlight two excellent ways to donate money and help us raise funding! The first, Pledge Direct, is a great way to give the same amount every month. Your gift arrives automatically through electronic funds transfer from your checking account or credit or debit card. Pledge Direct saves time and money with no more stamps, checks, or worries! Additionally, do you shop online, especially during the holiday season? Do you shop at Amazon.com? NAMI Central Virginia is enrolled in the Amazon Smile Program! 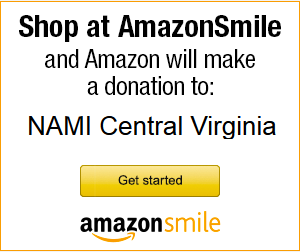 With Amazon Smile, shoppers that have registered with NAMI Central Virginia as their non-profit of choice will have .5% of their total purchase donated. Eligible products include most physical products sold on Amazon.com. This excludes digital music/video downloads and Kindle e-book downloads. If you are interested in this opportunity, please contact Jeff at the CVA office at 804-285-1749 or email jeff.conley@namicentralvirginia.org. October 17th was a great day for a Walk! 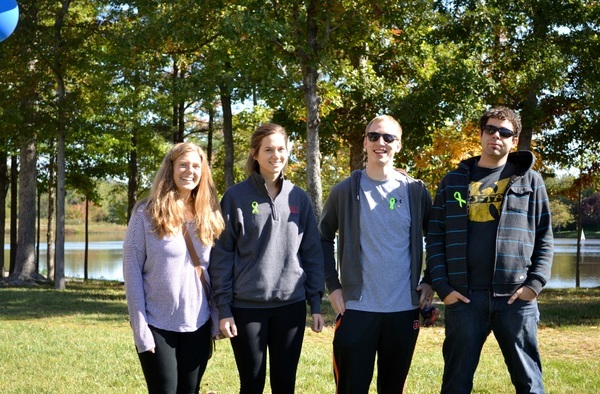 With crisp weather and plenty of sunshine, thousands of people from across Virginia hit the pavement to show support for NAMI and raise awareness for mental health. Below are a few photos from the day, courtesy of NAMI-CVA’s expert photographer, Patrice Beard. A good handful of volunteers cheered people on as walkers crossed the finish line. Hayden Myer and Sarah Steadman of NAMI Virginia enjoying themselves in the early part of the day! A diverse array of Walk Team T-shirts! NAMI Central Virginia is now hosting a new free youth program in partnership with Youth Move VA and United Methodist Family Services called HopeVoice! What is HopeVoice? It is a youth-guided activity-based group for teens ages 13-19 who have experience with a personal or family-related mental health condition. This is a relaxed environment for young people to come to, meet other teens, and join in on some fun activities! All personal stories and experiences are confidential and will not be shared. Pizza and refreshments are served at the group. NAMI CVA wishes to recognize Jennifer Giles in this month's volunteer spotlight! She is pictured above (center) speaking with attendees of the 2015 CBS Healthy Living Expo. Jennifer has been a part of NAMI since 2006, starting with her local affiliate in Kentucky. She served as President, and also Vice President of NAMI Lexington. After moving to Chesterfield, she stopped by the CVA office in early 2014 to introduce herself and discuss opportunities to continue doing programs and other types of volunteering with the affiliate here in Central Virginia. Since then, Jennifer has jumped right into the action. She is 2nd Vice President on the CVA Board of Directors, an active In-Our-Own-Voice presenter, and is a facilitator for the weekly NAMI Connection meeting at the McGuire Veteran's Hospital. Having a family-member perspective also, Jennifer is trained in NAMI Family-to-Family as well. She is always willing to lend a hand with the various community health fairs and other similar engagements. On top of this, Jennifer is a State Trainer for the In-Our-Own-Voice program, working with NAMI Virginia to train new presenters and connect with current ones at various Adult & Family Program events. If it isn't NAMI business being carried out, Jennifer also contributes to other organizations with a footprint in the Richmond area. She works with Chesterfield Court Appointed Special Advocates (CASA) and the Jewish Family Services Telephone Reassurance Program. Lastly, but certainly not least, Jennifer remains active with her sorority, Alpha Kappa Alpha, whom NAMI National has engaged in a country-wide partnership with.